This wizard helps you create a new project in the Workbench. When you first bring up the New Project wizard, you need to select the type of project you want to create. Select the General type if you want to create a generic project. To assist in locating a particular wizard, the text field can be used to show only the wizards that match the entered text. The name of the new project to be created. The location in the file system where the project will be created. Deselect "Use default location" to specify a location other than the default. You can type the new location or browse to select a file system location for the new project. 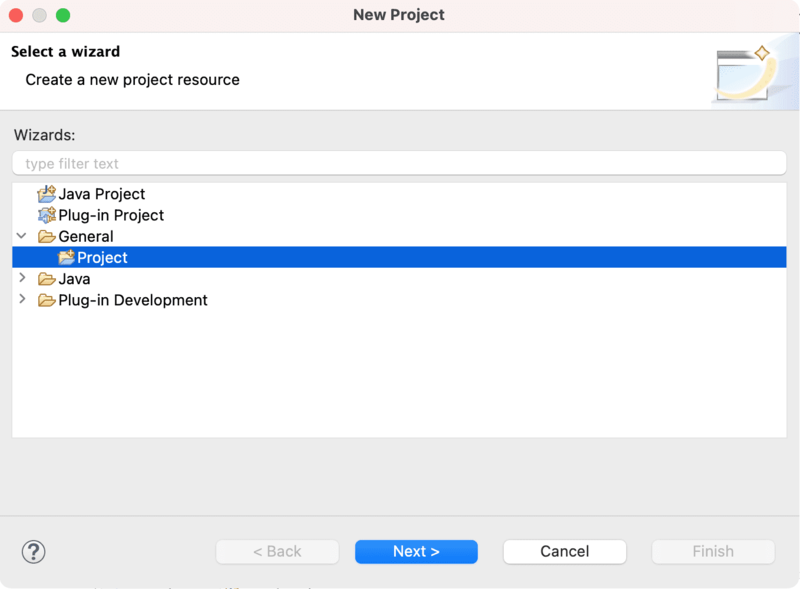 After you indicate a name and location for the project, you can either click Finish to create the project, or you can click Next to set up project dependencies on the Select Referenced Projects page. In the Referenced Projects list, you can set project dependencies for the new project. In the list of other projects in the Workbench, you can select one or more projects on which you want the new project to depend. Initially, no projects will be selected. Click Finish when you are done to create the new project in the Workbench. On the preferences page (Window > Preferences > General > Perspectives), you can change the way that new projects are initially displayed. For details on how to change this option see General.